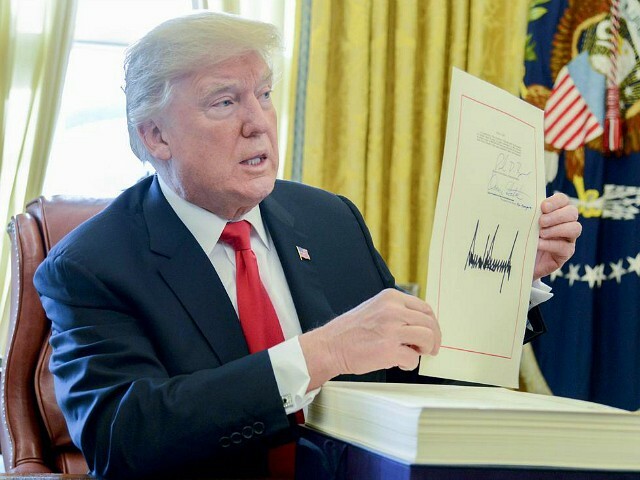 President Donald Trump will sign the compromise package funding the government and declare a national emergency on the border, the White House confirmed on Thursday. Trump’s decision gets him 50 miles of new physical barrier construction on the Southern border but concedes several Democrat proposals to ease legal pressure for migrants crossing the border and illegal immigrants in the United States. The over 1000 page bill is expected to pass the Senate on Thursday. “The President is once again delivering on his promise to build the wall, protect the border, and secure our great country,” Sanders concluded. Sanders told reporters at the White House that the administration was prepared for legal challenges to his declaration, which would allow him to shift funding to build physical barriers on the border. She said that the White House was still working on the details of the declaration. Trump indicated Wednesday that he was “not happy” with the final proposal, but conceded that he did not want another government shutdown. Republicans raised concerns about portions of the bill that would allow Texas border towns to block border wall construction and offer legal protections to illegal immigrants if they sponsored children crossing the border. Legislative text updated on Thursday morning included an expansion of H-2B visas, allowing corporations to import more cheap labor.